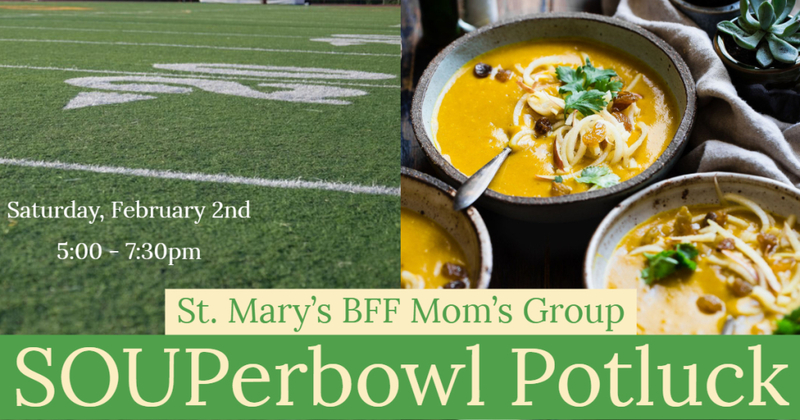 SOUPerbowl Potluck party sponsored by the St Mary's BFF Mom's Group Saturday, February 2nd 5:00 - 7:30pm in the Parish Center after 4pm Mass. Bring your best soup to enter in the SOUPerbowl (or side dish or dessert to share). Wear your favorite team jersey. This will be a great opportunity to meet some of the families from the mom’s group and see if you’d like to join our ministry.